The magical realm of Terrinoth lays before you, free to explore however you choose. In its rich literary landscape, the narrative adventure of Legacy of Dragonholt offers players a unique play experience that combines elements of roleplaying and adventure games, choose your own adventure stories, and open world video games. 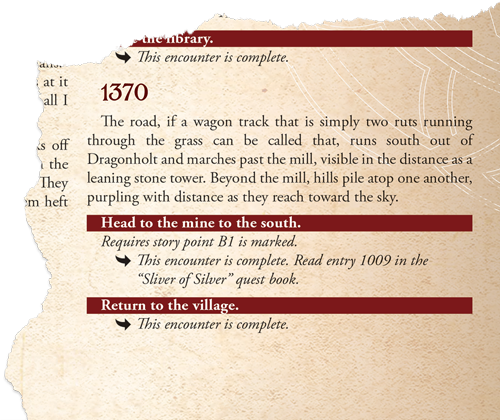 The expansive village book creates an open world for players to explore; one that continues to breathe and progress independent of characters’ involvement. The game system builds a vision of Terrinoth that changes based on what the adventurers have accomplished on their quests, who they do or do not know, and even the day of the week, allowing the players’ experience of the world to change with each playthrough. In our last preview we created a hero, the dwarf brawler Brigid, to explore Terrinoth as our avatar. The quests that you embark upon in Legacy of Dragonholt are a large part of the game, but equally important are your adventures in Dragonholt village itself. Here, Brigid's performance and streetwise skills will hopefully help the locals warm up to her and embrace this stranger in their town. If, however, she does get into a scrape, her knowledge of dueling and brawling may be able to get her out of a tough situation. Today, we will accompany Brigid as she navigates the village streets in Legacy of Dragonholt! We join Brigid on the third day of her adventure in Dragonholt. Today, the street is bustling with activity, full of carts groaning with produce and other goods. Vendors cry out prices, shoppers argue, and two guards march the length of the street to dissuade thieves and cheats. 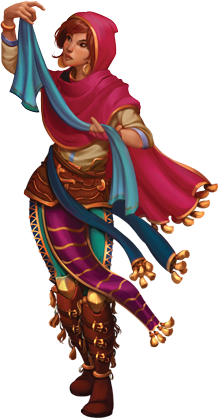 One cart near the end of the road catches the eye of our dwarf heroine, a gaily painted wagon with a sign that reads “Al-Emir’s Elixirs.” Brigid may choose to either browse the merchant’s wares, attempt to steal some coins, or leave the market. Brigid is naturally inquisitive and she is certainly not a thief, therefore she decides on the first option. Either of these elixirs could prove indispensable on future quests. The healing potion stands out to Brigid, who is traveling alone and lacks the medicinal training of an apothecary. However, as an experienced brawler who spent much of her life in the Free Cities of Terrinoth, Brigid is streetwise and may be able to negotiate for a better price. After some back and forth, the man seems deflated. His mysterious accent is gone too. “Alright, alright. Twenty-five for the healing potions, fifty for the potion of swiftness, and that’s as low as I can go. Have to make some profit in this backward town.” Despite the enticing drop in price for the swiftness potion, Brigid remains focused on her original plan and chooses to purchase two healing potions. 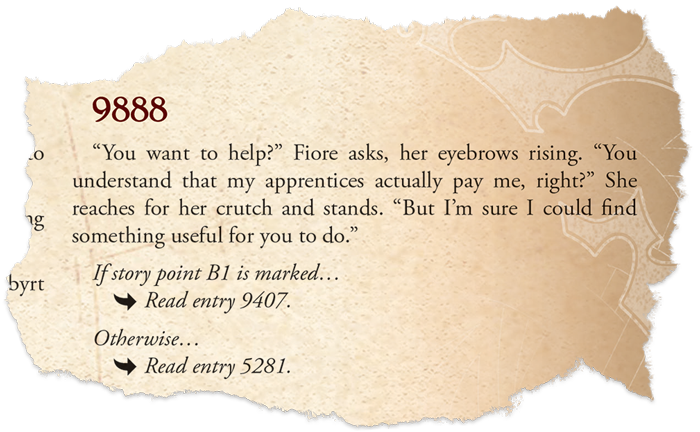 This interaction allows her to add one progress in social interaction, which is tracked throughout your interactions in Dragonholt Village as a way to increase your character's abilities. Satisfied with her purchase, Brigid slips the potions into her pack and leaves the market to continue exploring the village. At the end of the market row stands a low building with a grey slate roof and a thick chimney: the smithy. A silver hammer hangs outside the front door, inscribed with Dunwarr characters. A Dunwarr dwarf herself, Brigid easily reads the message: Fiore Brightmaul, Smith. As it is still early in the day, the business is open and, curious, Brigid ventures inside. A wide selection of weapons, armor, and other items for purchase populate the stockroom, but Brigid’s eyes are drawn to the smith herself. She is a sturdily built woman, simply dressed, with auburn hair pulled into a tight bun. Upon hearing Brigid enter, she takes a wooden crutch and works her way across the shop to greet her customer. Brigid recognizes a kindred spirit, knowing something herself about being a woman in what is typically a man’s profession. Her first instinct is to ask Fiore if there is anything she can do to help. “You want to help? You understand that my apprentices actually pay me, right? But I’m sure I can find something useful for you to do.” At this point, the Village Book instructs the player to turn to entry 9407, but only if story point B1 is marked. Brigid has not accomplished this, and therefore her tale continues with entry 5281. “I’ll tell you what would really help,” Fiore says, stomping toward a rack of shelves and papers. “There’s a silver mine, south of here past the willow grove. I’d like to get it re-opened, but there’s a small goblin problem. You wouldn’t know any adventuring heroes who have some free time, would you?” Brigid smiles to herself. Her brawling days and past adventures have equipped her with enough fame to offer her own services in clearing out the goblin band. As she casts her eyes over the map, the room labeled “blastworks” catches Brigid’s attention. Upon inquiry, the smith offers one key piece of advice, “Leave. Your. Lantern. Outside the room.” The people of Dragonholt want the mine intact, and it would cost the county a fortune to excavate the tunnels again. Fiore drops a heavy pouch of gold on the table. This hefty sum of fifty gold is just half the payment Brigid will receive for her troubles if she successfully completes her quest. Now, Brigid is faced with an interesting decision. Fifty gold pieces is itself a nice sum and she has already been paid. She does not have to trek south and risk life and limb to face a goblin horde alone. However, Brigid did take a liking to the smith, and her brawling muscles get stiff when they go unused. For her, the choice is clear. With gold in her purse and the promise of a thrilling quest before her, Brigid leaves the smithy and heads south towards the willow grove and the abandoned mines beyond. Terrinoth awaits. Gather your team of adventurers or set out on your own for new vistas and a bright future. 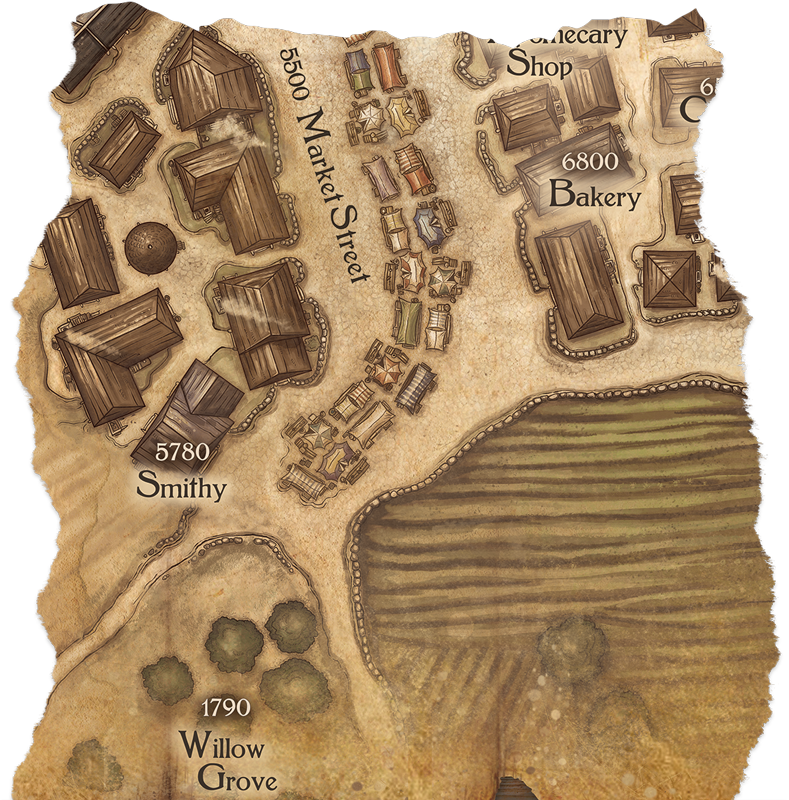 Explore the village of Dragonholt and discover the adventure that awaits you! 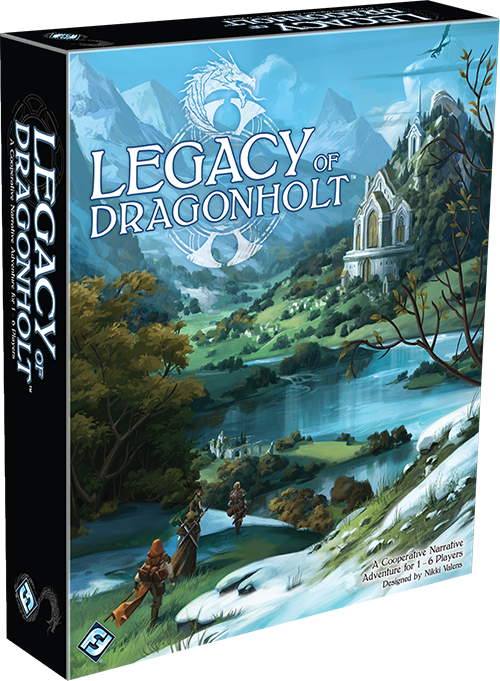 Pre-order Legacy of Dragonholt (ORA01) at your local retailer today or on the Fantasy Flight Games website here! 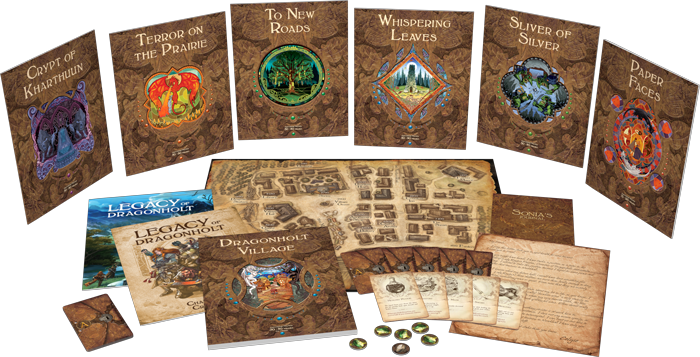 Legacy of Dragonholt is a narrative adventure game that takes one to six players to the remote village of Dragonholt. Players build their characters, embark on noble quests, and hopefully foil the plot of an evil overlord!